Owning your own space comes with a whole lot of upkeep, especially if you’ve sprung for a house. From the baking soda in the fridge to the smoke detectors outside your bedroom, it seems like everything needs to be switched out. The thing is, everything has its own schedule and time table, and who can remember that when you’ve got more important things to keep in mind, like…where are your car keys? That’s where HostUOnline Inc. & Hububashu.com’s iPhone app, HouseKeeper, comes in. Unfortunately, it doesn’t actually clean your house for you (in which case, download this app for $1.99 now! ), but it will allow you to set up reminders for when ten periodic household to-do’s are due. Tap on Settings, all the way down at the bottom of the list, and set up your alerts for either text messages or email (or both). 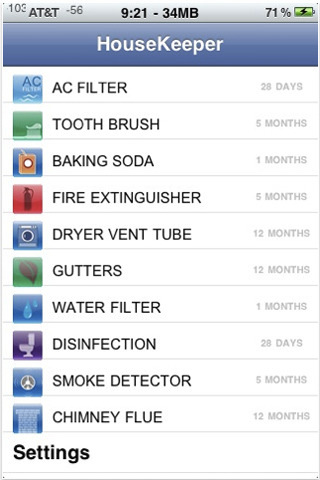 Then you can begin customizing the app to fit your household. For example, toothbrushes need to be switched out at least every six months. Just tap Tooth Brush on the list, input the date that you started using your toothbrush, make sure the interval time is correct, and voilà, you can rest assured that something will remind you to change toothbrushes six months from now. HouseKeeper is simple and effective at its job, but I wish there were more options, or an option for us to input our own household task; the developers’ top 10 reoccurring household chores might not coincide with mine, after all. Overall, though, the idea behind the app is solid, as is the execution–I like that these things aren’t cluttering up my normal calendar, and some items on the list are potentially life-saving, so you really should take a little time to download and set this app up. Who knows, maybe there will be an update with even more helpful tasks (or customizations, please). AppSafari review of HouseKeeper was written by Julie Guan on April 29th, 2010 and categorized under App Store, Health, Homes, Utilities. Page viewed 5846 times, 2 so far today. Need help on using these apps? Please read the Help Page. HouseKeeper is simple and I wish there were options. There should be an option to input our own household tasks. The idea for this app has merit, however, there should be an update giving the user the ability to customize the task list.